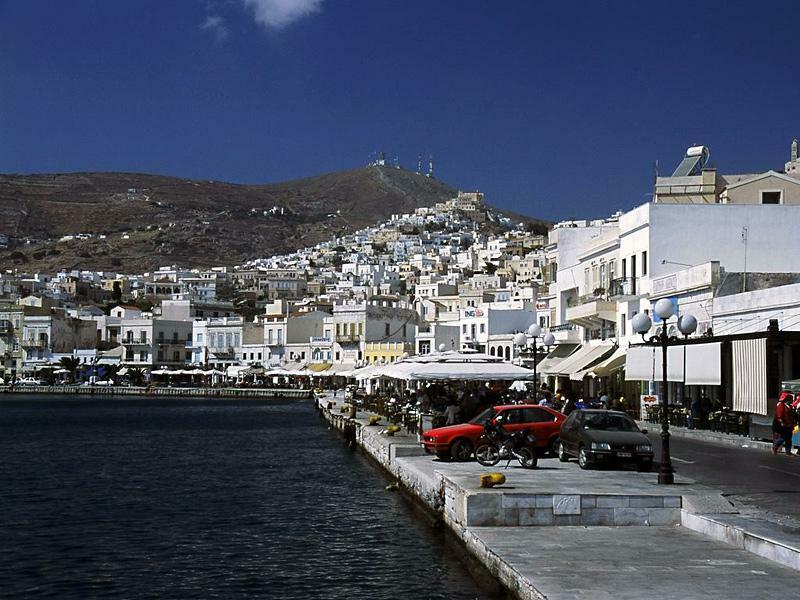 Together with Parikia port on Paros island, the ports and marinas of Finikas and Ermoupolis on Syros island are ideal for yacht charter vacations within the Cyclades, since starting from Athens would make it difficult to reach the more southern or eastern Cycladic islands. From Syros several excellent itineraries can be made, for instance routes F and J on my Cyclades Sailing Itineraries page. The adjacent island of Delos (Dilos) can best be visited from Mykonos (Myconos) as private docking of vessels without a permit is prohibited to protect the archaeological treasures here. Another good idea is to sail a oneway from either Athens or Lavrion towards Syros, with the prevailing winds from behind. This way you won't have to battle back to Athens against the northerlies and you will avoid the overlap - for the last day as well as the first day are spent in the same waters. Similarly the oneway from Syros to Kos or Rhodes are fabulous itineraries for sailing Greece and discovering the range of beautiful islands in the Aegean Sea, also see my yacht charters guide for more tips - unsurpassed for sailing holidays and yacht rental also for the luxury crewed superyachts or catamarans! August should ideally be avoided. Not only is the Meltemi havocking the seas with its disturbing winds, but the sheer number of tourists explodes, while outside the main season the real peaceful character and culture of the Cyclades shines through.